The former climatic spa of Wassenberg, located in the international ‘Maas Schwalm Nette’ nature reserve, was granted town rights as early as 1273 due to the favourable strategic location of its castle. Over time, a green belt with a special topographical structure developed at the foot of the castle keep dating from the first half of the 15th century. 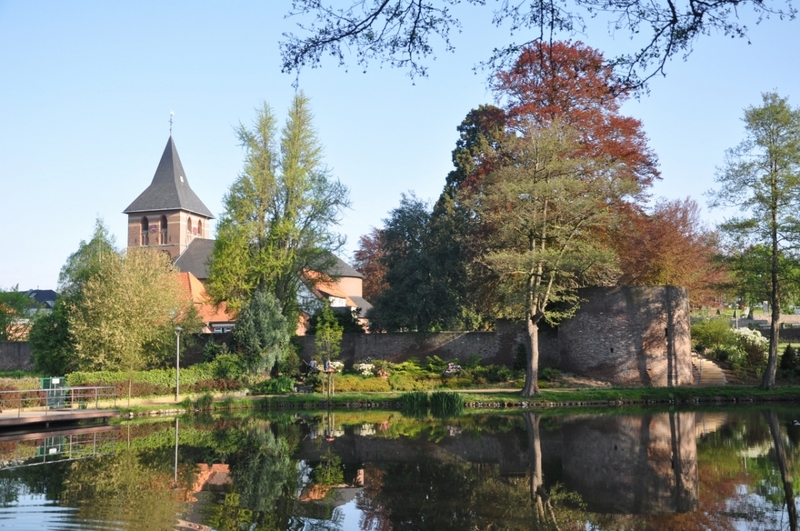 This green belt forms a town park which stretches out over the former mediaeval moat and continues past the Gondelweiher pond as far as the semi-natural Judenbruch. A concept for the outdoor environment with the motto ‘realizing the potential of what is there and discovering what is new’ was implemented from 2009 – 2011 as part of a publicly co-funded action plan for redeveloping Wassenberg. In keeping with this motto, the parks and gardens in the town present themselves in such a way that visitors can experience and spend time in them in different ways. 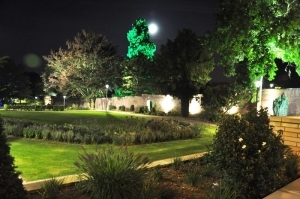 This diversity of experiences ranges from historical elements with particular botanical themes in the gardens and parks to modern architectural structures which are integrated into the landscape, including dramatic lighting effects, steps, raised platforms, open spaces and hedges. ‘Realizing the potential of what is there and discovering what is new’ – for visitors this means that both the history of the town of Wassenberg and the uses of its parks are reflected in various structural features, combining to create the overall picture of an organic town ensemble. The castle mountain is of primary importance, forming a topographically prominent core and town centre. Here the visitor finds interesting large spaces within the town which are rooted in Wassenberg’s historical basis as an extensive landscape park characterized by open spaces and gardens in which topographical and historically significant features are particularly highlighted. The park can be accessed from the town centre through the Synagogengasse, the entrance avenue to the Burghotel and the Burgstrasse by climbing straight and curved flights of steps with landings. The imposing 25 metre former dwelling tower (castle keep) of the fortified castle is reached by climbing a special flight of steps leading to the keep plateau. A fantastic panoramic view can be had from the plateau with its keep and buildings. Descending from the plateau, there is an almost bird’s eye view of the landscape park with its scattered stock of trees consisting of mighty oaks and more recent plantings such as pohutukawas, scarlet oaks, Norway red maples and Turkey oaks. A space for events is provided by a hedge theatre. Curved paths with accentuating viewing spots and places to stop and linger along with enlivening mixed borders and large lawns take visitors across the built entrance areas and into the formally-designed garden axis. The Gondelweiher can already be seen along the line of sight from this point. Two ornamental flowerbeds in the lawns are planted with spring and summer flowers and act as eye-catchers. The symmetrical networks of paths and steps around the areas of lawn along the historical town wall are bordered by brightly coloured arrangements of shrubs. Tall copper beeches and sweet gum trees as well as the almost year-round blossoms create an enchanting sight. To the south, the town wall and its partially accessible bastions separate the terraces of the garden axis from the small arboretum known as the “Küstersgarten”. Wilhelm Küsters, a doctor and a co-founder of the “enhancement association”, developed a marked love of trees and planted a tree collection of special species between the bastions and the Stiftsplatz in 1870. Parts of this collection which are now natural monuments include a ginkgo, a Kentucky coffee tree and a giant sequoia which towers over everything else. During the last development of the park these were supplemented by a zelkova, handkerchief tree, Cappadocian maple and other exotic trees in the spirit of the garden’s founder. 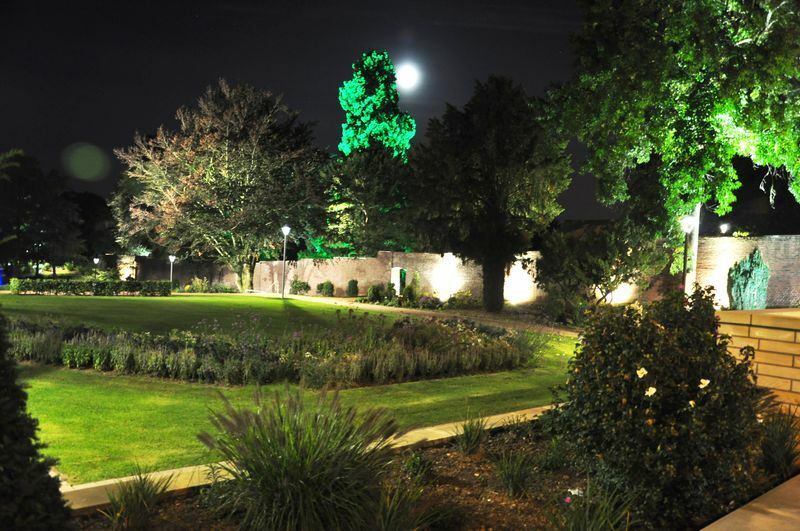 The illumination of the rare trees, the spotlighted fragments of the town wall and the view of the illuminated late-Gothic collegiate church tower dating from the 15th century make it possible to experience the park in the evening hours. A visit to the park after nightfall, when the complete park shines in a new light, is recommended due to the lighting concept. Bordered by alders, the Gondelweiher pond with its walk-on wooden decks and fountain lit up in blue can be found in the lower part of the park. A water feature forms the central structural element of the rose garden adjoining the Gondelweiher. The Judenbruch is reached from the rose garden by crossing Pontorsonplatz and walking past the meeting centre. From 1878 onwards, Oskar von Forckenbeck – who was also founder of the newspaper museum in Aachen – and his forester Leonard Wild structured this area of moorland into a woodland park, the heart of which is formed by four ponds with moor water. These areas of water are connected by canals, streams and natural cascades and can be reached by crossing wooden bridges. The charming hilly landscape of the Wassenberg horst reveals itself to visitors due to the very varied layout of paths. Unusual giant trees can still be found in this 50-hectare “jardin du plaisir” designed by Oskar von Forckenbeck, among them a cut-leaved beech, Japanese cypress, pin oak and Douglas fir. Modern design structures for paths, steps, spaces, entrance areas and spots where visitors can linger and rest are linked with the various – in some cases historical – garden elements as part of the implementation of the ‘Gartenpark Wassenberg’ concept in accordance with the above-mentioned special motto. Among these are above all the lighting concept and the inclusion of ground-covering plants and striking solitary plant structures. The flyer „Historischer Altstadtrundgang“ (download as Pdf, German only) guides you to the most important buildings and sites within the historic centre of Wassenberg, such as the castle, and the town walls.